The 3rd edition of our award-winning career guide is now available! Show kids how engineering will help them make a difference in the world! Engineering is a great career option. We highlight all the cool things engineers do to make the world a better, safer, and more fun place. Engineering is the driving force behind new green technologies to combat climate change. Engineering can offer meaningful work at a good salary and options, options, options, for graduates. Includes updated data on degrees, schools, and salaries. PLUS: Tips and strategies for getting in and paying for school. Discounts available for bulk orders—email bblack@start-engineering.com for details. Take a closer look—see sample pages from 52-page publication below! Almost 20 years ago, the Start Engineering team created Engineering, Go for It!, the first engineering outreach publication designed to make engineering accessible and exciting to K-12 audiences. Then we built a franchise around engineering outreach that reached over a million students and teachers through a magazine, a website, meetings and workshops, and partnerships with industry, government, and non-profits. Now we’re building on this legacy. 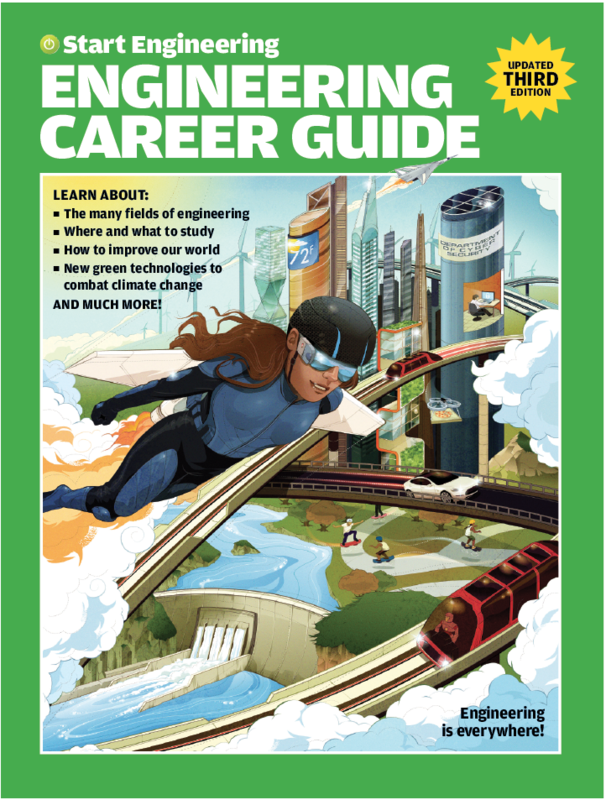 As always, our career guide shows middle-school and high-school students how they can make the world a better place through a career in engineering. Coming soon! A FREE PDF workbook to help students identify the field of engineering that’s right for them. Free with custom orders, for sale online to all others. The Start Engineering Career Guide can help you show the students you’re trying to reach how engineering at your school can be the right choice for them. Call us at 202-244-5575 for more information.